BBC radio has a unique heritage when it comes to Shakespeare. Since 1923, when the newly formed company broadcast its first full-length play, generations of actors and producers have honed and perfected the craft of making Shakespeare to be heard. 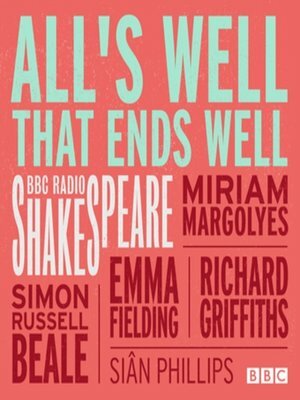 In the acclaimed BBC Radio Shakespeare series, each play is introduced by Richard Eyre, former Director of the Royal National Theatre. Revitalised, original and comprehensive, this is Shakespeare for the new millennium. All's Well That Ends Well finds Helena rewarded for her ministries to the sick with the choice of any husband she wishes. Her choice, Bertram, is unwilling to have her as his wife and sets her a number of seemingly impossible tasks to complete before he will relent. Emma Fielding, Siân Phillips and Miriam Margolyes star.